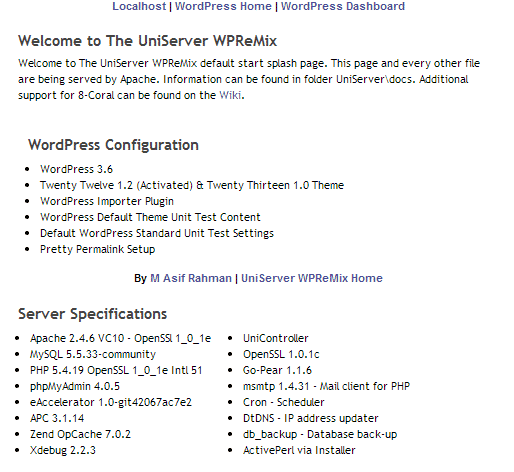 If you are wondering its based on UniServer, which is based on WAMP and licensed in the Apache way. 2. Put the “UniSrver” in a root drive, like C: drive or D: drive. Don't put it inside sub-directory. 3. Run “Start_as_program.exe” or “Start_as_service.exe” to start server. 5. Now Visit “localhost” or “http://localhost/” from any browser. The WordPress Logins and MySQL Database details are inside in the Readme.txt file. # This is just for testing purpose locally. Please change all password and DB info immediately. # Though its very easily possible to make this server accessible externally, but I dont recommend that. # As a safety measure I have disabled the bot access and Search Engine crawling.